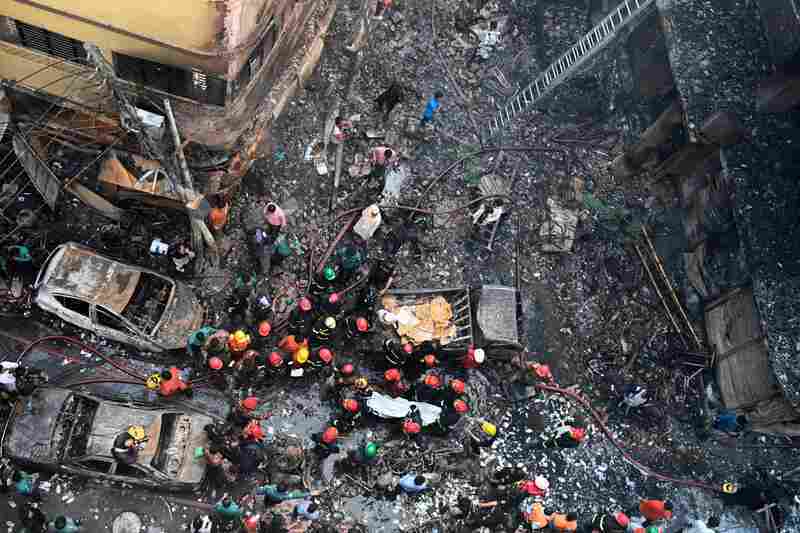 Bangladesh Fire Kills At Least 70 People The blaze swept through several buildings in Dhaka's centuries-old neighborhood of Chawkbazar while many people were asleep. Locals and firefighters gather around buildings that caught fire late Wednesday in Dhaka, Bangladesh, on Thursday, killing dozens of people. 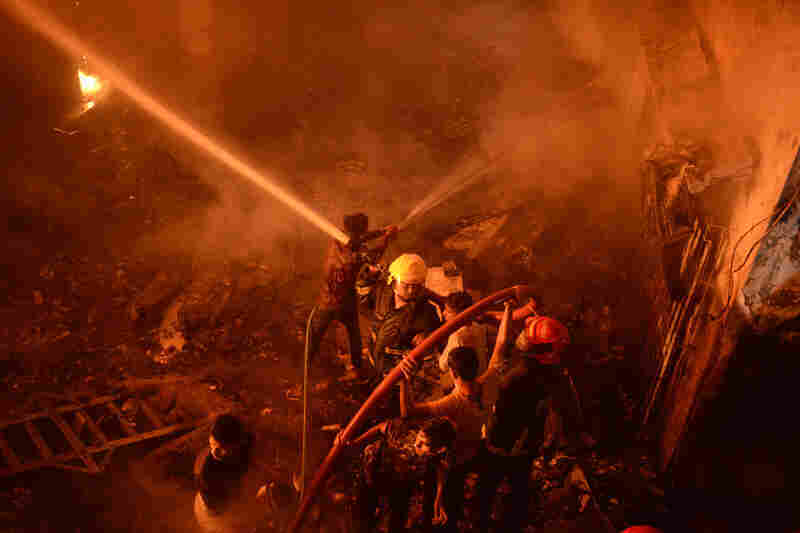 Firefighters try to douse flames after the devastating fire that raced through at least five buildings in an old part of Bangladesh's capital. Rescue personnel carry the body of a fire victim in Dhaka on Thursday. A relative of victims who were killed in a fire mourns. 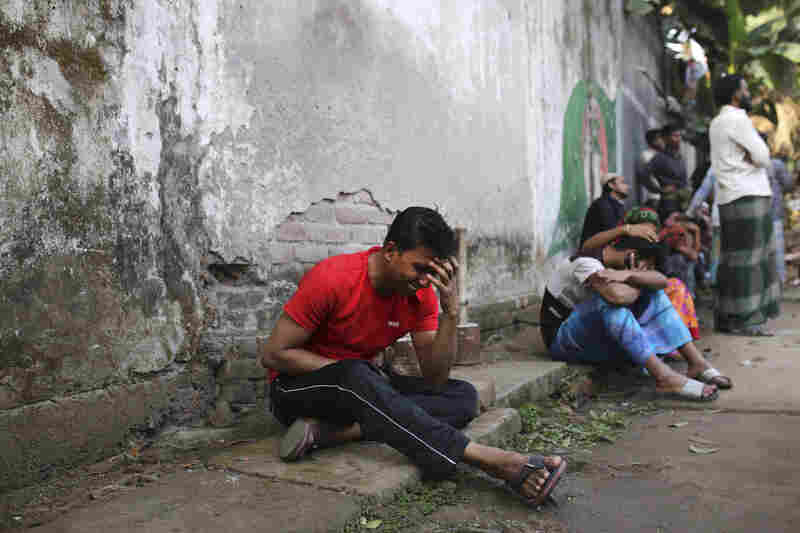 An unidentified Bangladeshi man cries by the site of a fire that broke out late Wednesday in closely set buildings in the capital. A fire raced through the capital of Bangladesh on Wednesday night, killing at least 70 people and injuring dozens. 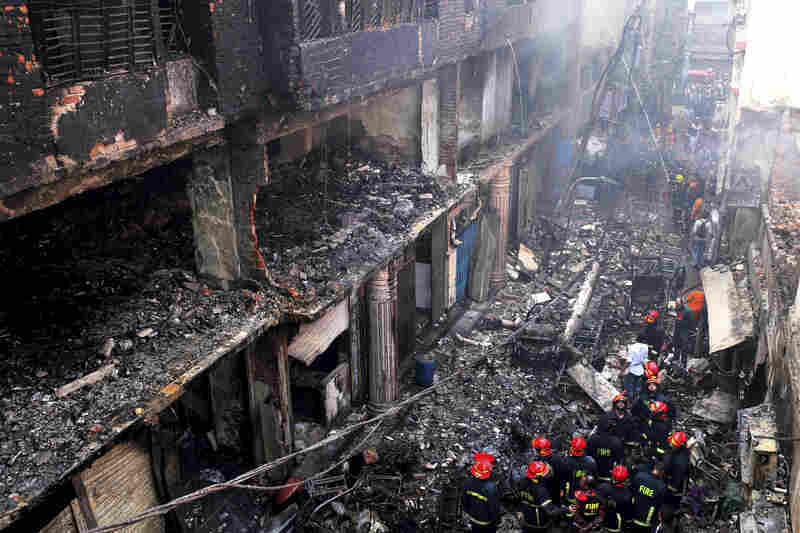 Fire officials say the blaze began in a partly residential four-story building in Dhaka as most people were sleeping. The exact cause of the fire isn't clear. The BBC reports that it started at a chemical warehouse; however, The New York Times cites witnesses who said a compressed gas cylinder like the kind used for cooking was the cause. Shopowner Haji Abdul Kader told Agence France-Presse he "heard a big bang," and then "saw the whole street in flames. Flames were everywhere." Kader's shop was destroyed. The fire was fed by paints and other chemicals stored in shops on the building's ground floor, the Times reports. It then spread to buildings in the centuries-old Chawkbazar neighborhood in Old Dhaka. Two of the buildings were so badly burned that officials feared they may collapse, according to CNN. One of the buildings was a warehouse for a perfume company, and the plastics and chemicals stored there quickly ignited. The Associated Press reports that fire officials spent more than nine hours putting out the deadly fire. Many victims were trapped in buildings, one fire official told the AP. 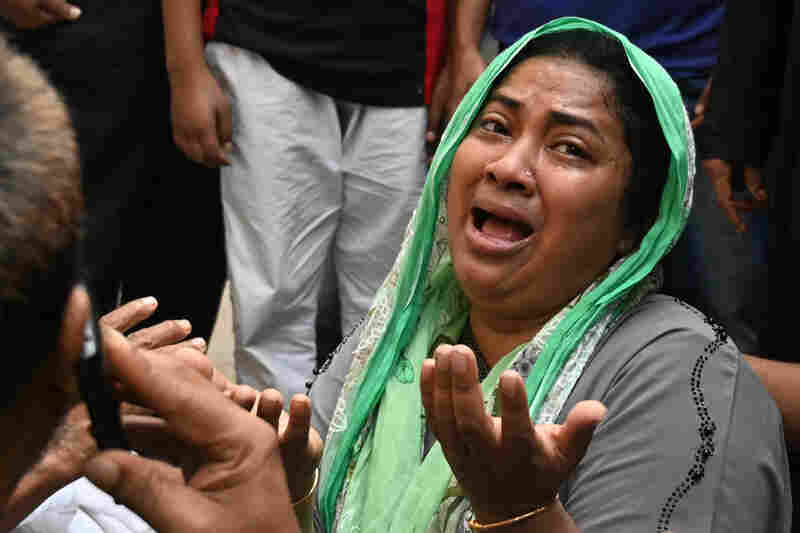 "Many of the recovered bodies are beyond recognition," said Mahfuz Riben, a control room official of the Fire Service and Civil Defense in Dhaka. "Our people are using body bags to send them to the hospital morgue. This is a very difficult situation." Major fires have become relatively common in Bangladesh. In 2016, a factory fire at a packaging factory just north of Dhaka killed at least 21 people. Chemical storage was also likely to blame for the quick spread of that fire, AFP reported at the time. In 2013, at least 10 were killed in a garment factory fire.